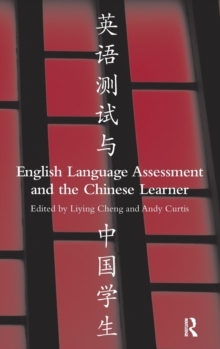 'This volume addresses a very timely and important topic, and provides both broad and in-depth coverage of a number of large-scale English tests in China, including Hong Kong and Taiwan, and about the Chinese learner.' - Lyle F.
Bachman, From the ForewordBuilding on current theoretical and practical frameworks for English language assessment and testing, this book presents a comprehensive, up-to-date, relevant picture of English language assessment for students in China (Mainland China, Hong Kong and Taiwan) and for Chinese learners of English around the world. Written by well-recognized international scholars in language testing, it covers:the history of tests and testing systems, issues and challenges, and current research in Chinaboth test-designers' and test-users' points of view on test development and test validation within a range of political, economical, social, and financial contexts in Chinatheoretical/conceptual perspectives on the use of the English language assessment at different levels, including societal, university, and schools empirical research related specifically to test development, curricular innovation, and test validationGiven the long history of objective testing and its extensive use in Chinese society, and considering the sheer number of students taking various tests in English in China and elsewhere, an understanding of the impact of English language testing is essential for anyone involved in testing and assessment issues in China and elsewhere in the world. This is a must-read volume for testing and assessment policy makers, curriculum designers, researchers, ESL/EFL materials writers, graduate students, and English language teachers/researchers at all levels.